Ok so I really tried to work hard and just stick to one project. I was just going to knit mystic light (and maybe some socks) but I was going to wait before starting this next project but I couldn't help it. It turns out I like the yarn for mystic light more than I like the pattern. So on the positive side I actually finished two of the clues before the next clue was released which was rather interesting for me (especially with all of the yarn showing up in the mail from the Woolen Rabbit). 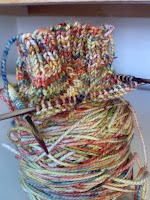 I think I will eventually knit Mystic Light but I'll use a different yarn. It's funny how I feel guilty sometimes when I'm stopping or starting a new project. Its not like the project is going to say "hey you have to finish me first," although I swear the Magic Carpet yarn has been trying to seduce me for weeks! 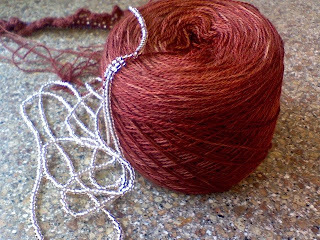 As soon as the beads arrived those too were totally teaming up and well, frankly I was helpless, it just happened, the beads got on the yarn and well I casted on I even may have knitted a little, not a lot...but definitely a little. I also may have started another sock. Just one little quick and easy sock. I couldn't help it when I went upstairs to look for something else the koigu just jumped onto some needles and well the pattern pretty much knits itself...Honestly look at that koigu, how could any knitter resist it. The truth is I was going to start on this but I couldn't locate my size 0 needles, they are still being evasive so I needed something to knit while waiting to find the size 0 needles. So there are lots of changes going on. Projects put on hold and projects started. I strung the beads for Magic Carpet (MC) yesterday and started about 10 rows of it and I was in heaven (ok so maybe I knitted a little more than previously mentioned). I also started a pair of socks with someyummy yarn so in case the MS flares up I'll have a back of easy project. So far so good. So aside from changes in my knitting progress I've also been planning for some changes in my life. I'm constantly having to adjust or adapt to depending on my health and we (my husband and I) have recognized that where we are currently living is not exactly conducive to my mobility issues. When we bought our house I loved that it was two stories tall with high ceilings but now that I've got MS those stairs feel like a death trap and I've already fallen down them enough to know that they are just not working for me. So we are planning on moving back down to San Diego to be closer to our family and better hospitals. So in the meantime current house has turned into a construction zone. Painters, gardeners, more painting. It's been a little unsettling for me so as always I've turned to knitting to help get me through it. I historically have not done well in adapting to change, I don't like change and normally change doesn't like me but I've learned (naturally the hard way) that not all change is bad. We need to change and as much as I hate to admit it I have learned quite a lot from periods of intense change. I'm aware each day to be thankful for everything, for my friends and family, for my pets, for my life experiences so far. I have to be thankful and enjoy each second of each day because I never know how I'm going to feel or if I'm going to be mobile or not. The sad thing is that I would much rather give up my physical ability than to have to come to terms with the neurological dysfunction that occurs in my brain from time to time. I know that it sounds horrible to say that but for so long so much of how I saw myself was associated with my brain and my academic achievements. So it all comes back to definitions again. How do I define myself and how will I continue to change that definition. I have MS, I am not MS. I've graduated college, I've attend grad school and I hope that the time will come when I am able to complete my thesis and obtain my master's. The funny thing is a few years ago I would have considered not finishing my thesis a total failure. I would have balked at the idea of taking time off of from school and I would have pushed to just keep going. It's one of the unexpected bonuses of having fibromyalgia and MS, they band together and force you to listen to your body and slow down. The definition of "me" prior to MS would view "keep moving forward" as keep moving as fast as you can as quick as you can forward, forward, forward, forward, did I mention forward and quickly? Its amazing what a little MS can do for a girl, you know? I'm realizing that it's important to keep moving forward but its ok to stop and snuggle the yarn every once in a while. Its ok to change your mind halfway through a project and rip it out. Its ok to try harder projects that intimidate you because you aren't sure if your brain is going to be cooperating that day. Projects that in the past you would have felt no unease fear may take me a little longer now but it still only comes down to one stitch at a time. One stitch forward, maybe a few stitches ripped back and I'm realizing that it isn't so much as important to me for every single thing in my life to be wrangled and controlled. As much as I have spent the majority of my life being a total type A over achieving control freak I'm realizing that my body (with its very challenges) in its own way is being its on over achiever just not in the way that I would have chosen. New paint on the inside and the outside of my current house makes me change perspective a little. Some of the cracks and bruises have been patched and painted but its still home. The colors may have changed but the integrity of the home stays in tact. While one project has been set aside another one is providing challenge and joy. Moving will be a process but the end result will be so worth it because we'll be surrounded by our family. Family is important and when the chips are down I know that I've got a great family that loves and supports us. "The important thing is this: To be able at any moment to sacrifice what we are for what we could become. -- Charles Dubois"